Meet Gail A. Severini, VP Holt Renfrew - BeSocial Event Management Inc.
Gail A. Severini is a seasoned execution executive, and has partnered with business leaders to deliver their strategies for more than 20 years. Gail is a Vice President at Holt Renfrew responsible for Change Management. She has led teams launching products/services/startups, business model innovation, Customer Centricity, Operational Excellence and Health Care Reform (US). Gail also works with organizations to build transformation capability. This includes mindsets, structures, processes, methodologies and skills. A graduate of Queen’s University, Gail holds several certifications in Change Management. She has worked with many North American and global organizations, including: RSA Canada, Manulife Financial / John Hancock, Royal Bank of Canada, CIBC, Trillium Health Centre, Canadian Blood Services and Highmark Blue Cross Blue Shield. 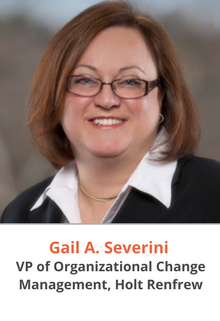 Gail publishes periodically on her blog, Change Whisperer, and speaks often on strategy execution and change leadership.